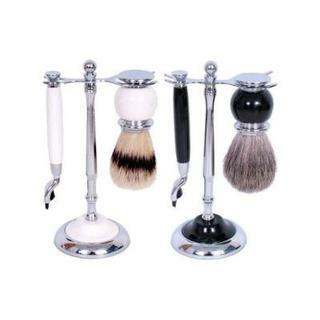 Complete sets of shaving gear usually including brush, shaver and stand. 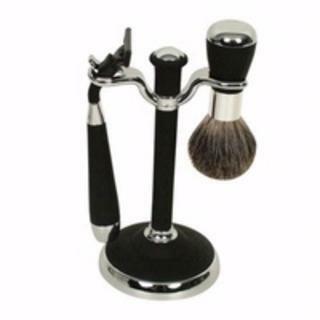 A quality pig bristle shaving brush and Gillette Fusion blade safety razor on a stand. Don't forget to add some shave cream or soap. 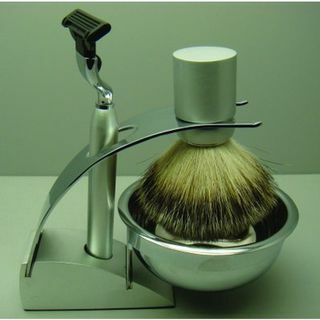 A quality pig bristle shaving brush and Gillette Mach 3 blade safety razor on a stand. 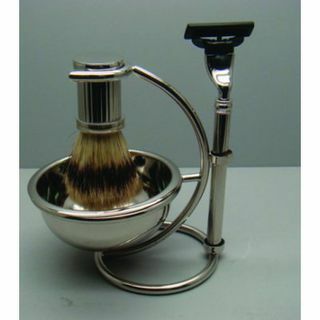 A highest quality badger hair shaving brush and matching safety Mach 3 blade razor on a quality stand. Get some shaving cream or soap as well so it's ready to use. 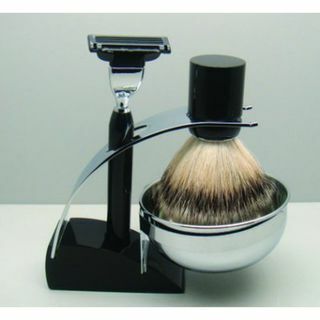 Comoy 3012 Mach 3 Razor & real badger brush - black or white. 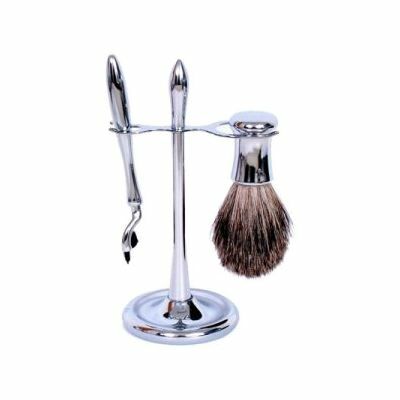 A highest quality badger hair shaving brush and matching safety razor on a quality stand. 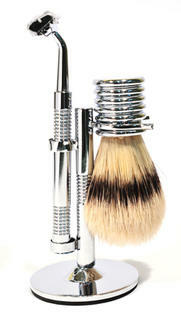 Comoy 3044 White Brush & Razor Travel Set with Gillette Mach 3 blade. 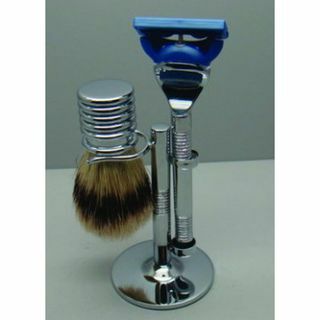 Comoy shave set comprising of a stand holding a shaving brush (synthetic hair) and a razor handle compatible with Gillette Mach 3 blades. 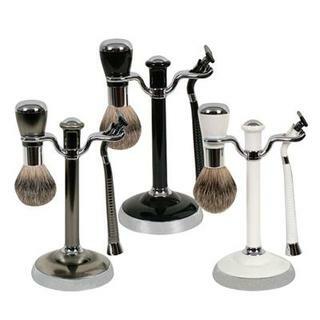 This set is stylishly coloured in a pewter or black or white (o/s) with chrome finish. A perfect addition to any Gentleman's bathroom shelf. 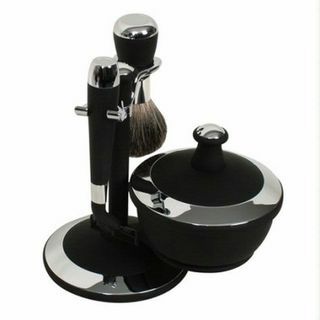 This set is stylishly coloured in a satin black with chrome finish. 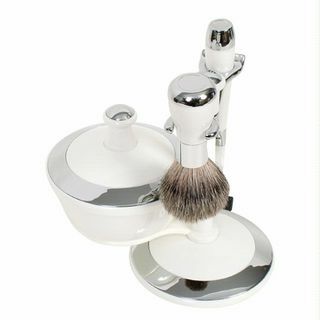 Comoy 3 piece shave set in white acrylic with anodised chrome detailing comprising: stand, synthetic hair brush, shaver holder (fits Gillette Mach 3 blades), bowl with mirror in the lid. Every thing you need to start shaving - just add shave cream or shave soap. bowl with mirror in the lid. 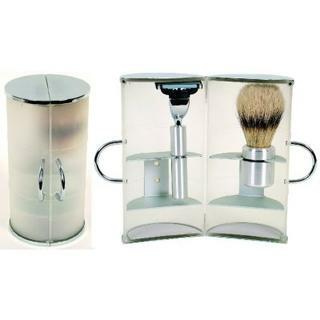 Comoy 3 piece shave set in silver with anodised chrome detailing comprising: stand, synthetic hair brush, shaver holder (fits Gillette Mach 3 blades), bowl with mirror in the lid. Every thing you need to start shaving - just add shave cream and Mach 3 blades. 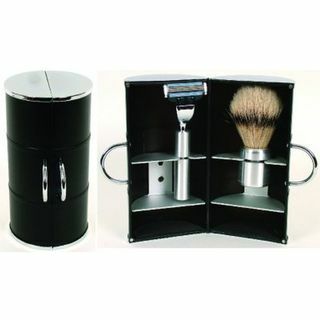 Comoy 3 piece shave set in black acrylic with anodised chrome detailing comprising: stand, synthetic soft touch hair brush, shaver holder (fits Gillette Mach 3 blades), bowl with mirror in the lid. 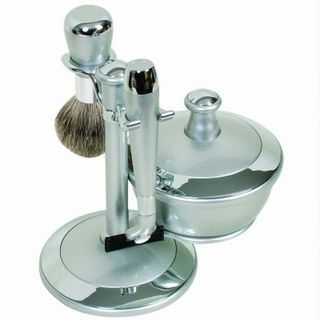 Comoy 3 piece chrome shave set comprising: metal stand, pig bristle brush, shaver (fits Gillette Mach 3 blades) and lather bowl. Everything you need to start shaving - just add shave cream or shave soap. 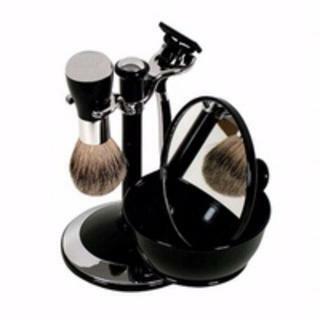 black and anodised chrome stand, badger-hair brush, shaver holder (fits Gillette Mach 3 blades), chromed metal bowl. 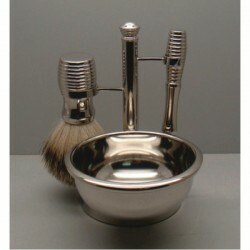 chromed metal stand, badger-hair brush, shaver holder (fits Gillette Mach 3 blades), chrome bowl. 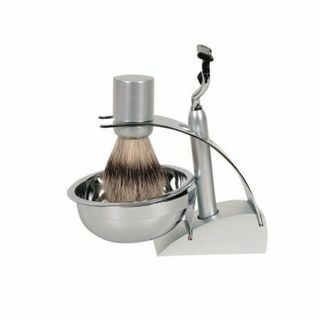 Comoy 3 piece nickel-plated metal shave set comprising: stand, top quality Badger-hair brush, shaver (fits Gillette Mach 3 blades) and lather bowl. Comoy brand, shave brush holder in the shape of a scallop shell. 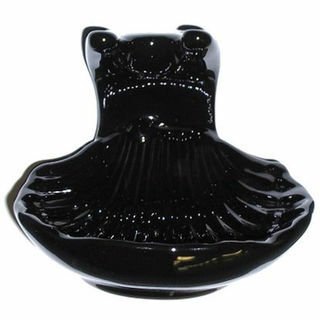 Manufactured in black ceramic with a gloss finish.